The obijime is a decorative, braided cord, that is tied around the obi. Until the second half of the 19th century, these cords weren’t being used to tie the obi. The obi back then wasn’t as wide as the obis used nowadays and could, therefore, be tied without any further accessories. It wasn’t until the end of the Edo-period/ beginning of the Meiji-era that these cords were in common use, as the obis became wider and needed additional fastening methods. Geisha or Maiko used the „sageo“ (jap. 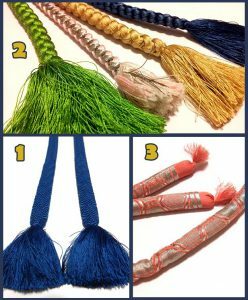 : 下緒, cord used to fasten a samurai sword to the obi of a kimono) of their clients in a playful/flirtatious manner by using it as a decoration for their obi. After the class of the samurai was outlawed the kumihimo craftsmen began searching for other ways to use their kumihimo cords. One of the new ways to use them was as a cord for the obi. When a samurai died, his widow would be sent his sageo. She would then bind the sageo over her obi as a symbol of her sorrow. From this, the custom of wearing a kumihimo cord was born. (I have not been able to find any written source material for this version however as of yet). As mentioned, the obi became much wider as time went on. Therefore it was necessary to secure the obi with an additional cord, so it wouldn’t slip out of place. Just like with kimono and obi, there is a sheer infinite number of variations for obi cords. Some are round and thick, while others are flat and thin, and others can even be covered in fabric. Just like with kimono and obi, you have a sometimes difficult choice between all the different materials, techniques, colors, motifs and patterns. But naturally, there are things you should know in regards to wearing an obijime. Obijime can be found in different widths and lengths. In general, however, they are about 1 centimeter thick and are about 150 centimeters in length. The thinnest obijime are the so-called „nibuhimo“ to my knowledge with a width of about 6 millimeters. The thickest are around 1,5 centimeters wide („gobuhimo„). That a thinner obijime is easier to tie and to tighten is, of course, self-explanatory. There are three different profiles types an obijime can have: round, oval and flat. Furthermore, there is a connection between the cross-section of an obi cord and how wide it is. You can see this, by how obi cords with a round profile are generally between 6-10 millimeters wide. I haven’t seen any round obijime wider than this, but I think that making them wider would probably result in them just being impractical. It would probably cause the knot to be thicker and thusly just make it look overbearing! With multistranded obijime, the individual strands are usually about millimeters thick. Flat obi cords can be found in an average width between 6 and 15 millimeters. Here you can find the same principle: the thicker they are the harder they are to tie. Hiragumi-Obijime are braided, flat und between 0,6 cm and 1 cm in width. Marugumi-Obijime are braided, have a round profile and average at about 0,5 cm to 1 cm in width. Maruguke-Obijime also have a round profile. However, they aren’t braided, but sewn out of fabric and then, for example, filled with cotton. They have a width of about 0,6 to 1 cm. 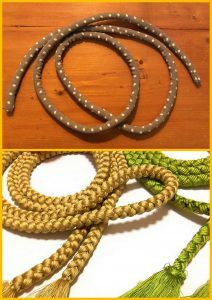 (photo), out of a woven trimming or even a stiff, spun cord. There are hardly any limits to the imagination here. But there is one characteristic all obijime must have: they can’t be elastic because they have to be able to maintain their shape and length even under the strain of being tied around an obi. As long as the material won’t elongate and you can still tie a knot with it, it’s qualified to be used as a obi cord. Of course, the width and thickness of an obijime shouldn’t be exaggerated too much or thinned out the point of no recognition. If you make an obijime about 1 centimeter wide or wider it can become difficult to tie and the knot can become too big. If you make it too thin, however, it just won’t have the necessary strength to do it’s “job“ of keeping your obi in place. You’ll find more information on marugumi, hiragumi und maruguke in the upcoming related articles! The translation of the original version of this article into English was kindly provided by Annie Blackweather, https://annieblackweather.wordpress.com, known on Facebook as Lynn Kiriyumi. Posted in Kimono-Accessoires, Kimono-Hilfsmittel, Kimono-Zubehör and tagged braided, cross-section, flat, Hiragumi, kinds, main groups, Maruguke, Marugumi, measurements, obijime, round, sewn, types, variations, まるぐけ, 丸組帯締め, 平組帯締め. Thank you for your very nice article. 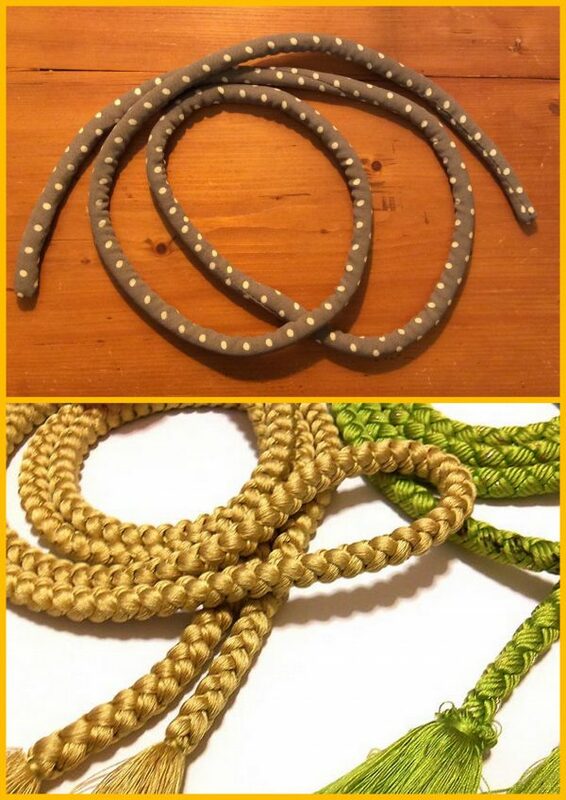 However, some of your information is not correct – the Hiragumi and Marugumi are all „braided“ cords, using the Japanese braiding technique called kumihimo. Weaving and braiding are not the same thing, and although many of the hiragumi appear to be woven, they are actually braided. The difference between braiding and weaving is that braiding is done on a diagonal with no fixed elements; weaving has a fixed set of elements or threads called the „warp,“ which usually form the vertical threads when weaving; the horizontal thread is called the weft. 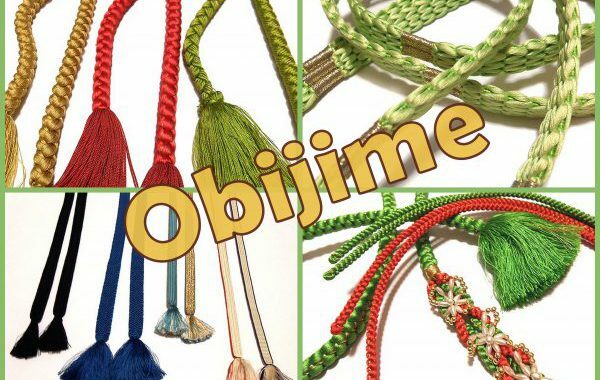 Although a majority of obijime are now made by machine, there are still a lot of people out there doing kumihimo by hand, making custom obijime. I studied at the Domyo school back in 1979 so I have been doing kumihimo for nearly 40 years now. Thank you very much for finding those translation mistakes. The article was translated from the German version (where I am using the German term for braiding consitently) into English not by myself, as my mothertongue is German. A very nice person willingly helped me out with the translation. You are absolutely right, it should be „braided“ and not „woven“. I know the difference between both of them and I practised kumihimo for some years, too. I’m very sorry not to have noticed those mistakes. It might be for your delight to know that I have corrected the two translated articles about obijime (replaced woven by braided). Hopefully, they will be fine like that. Dear Michael, I am very grateful for your hint. Thanks to you the article has improved!